Deciding between baseball and football can be a difficult choice: Marino and Brady both considered the bigs before choosing the gridiron, and Deion managed to do both well, despite being unable to hit in either. For a company that'll let you do both, via hilarious shirts, check out Phanadelphia. 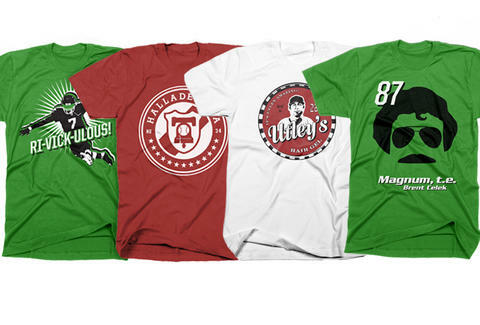 From two guys out of Exton, Phan's a catchphrase-generating t-shirt biz that assigns slogans to star players on the Eagles, Phils, and the Soul. Just kidding, they barely have uniforms. On the hardball tip, there's a formal badge centered by a ball and Liberty Bell declaring the city "Halladelphia", a logo complete with the slick-haired second baseman for Utley's Hair Gel ("It's Utley Amazing"! ), and a tribute to The Hangover, with the three bffs replaced by Utley, JRoll, and a baby-toting Howard, whose Big Piece you see way too much of in the end credits. Getting into football are jawns like "Magnum, t.e. ", which confuses Brent Celek with the well-mustached Tom, "10 Speed" and "Re-Vick-ulous", featuring the star WR and QB's silhouettes against sunburst backdrops, and "Don't Do It, Andy", which lampoons the coach's poor decision-making when it comes to dieting the Super Bowl time management parenting replays. If you're the clingy type, Phan's even doing a shirt for a guy that ain't here anymore, with the big-lettered "Dawkins Forever", whose star will never fade in Philly, even though he’s past his prime time.